yeah, it's a pretty big problem, it's hard to do anything without having 200 sentries around. I really like this mod! Is it okay to suggest a feature? Are you still supporting 1.10? 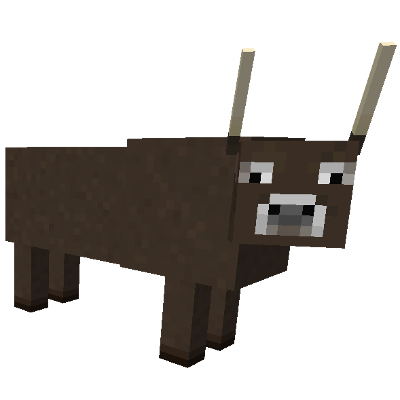 It would make toroquest more compatible with other mods that add or replace animals if in the config file players or modpack designers could flag modded animals/mobs in a list as 'Bovine' 'Domestic" and 'Dangerous' and maybe "Wild' to 'teach' the villages and Toro to respond realistically. In my 1.10 test world I didn't get credit for breeding modded sheep. I lost reputation for killing a Grizzly Bear that was killing domestic animals. I was mauled to death in the village by a lion that was ignored by the sentries and guards. And there are animals like rats, poisonous snakes, wild boars and scorpions that I doubt the village would really mind me killing in real life to keep the village 'safe'. I don't know if Toro would recognize my pen of Holstein as cows. I haven't killed any yet. You could also have a list in the config for 'Crops' and 'Food' like those added by farming mods so player could give the village lord a variety of cool foods for the village or get credit for farming things like turnips or broccoli. Too much sentry goes on the territory (about 50). Is it possible to add in config the value of the spawn. Hi! This seems like a really nice mod, but I can't make out if I can add it "seamlessly" (as good as can be expected) to a current world I've already created. "Guards spawn in village provinces during world creation. They do not spawn after creation and never despawn." Does this mean that even if I generate new terrain, there won't be any Guards? I understand that current villages I've already generated might (?) not be included into the features of this mod (faction, buildings, entities etc), but does that hold for newly generated as well? Thanks! This mod can be added at any time, however the entities in the village will only spawn if a village is newly generated. So if you find a new village that is being generated for the first time after adding this mod, the village should have more buildings and entities in it. All existing villages will be same, however if you have OP access, you can spawn the entities in with eggs. Is this mod incompatible with minecraft comes alive? I've got both installed and while MCA seems to be working, I can't find any villages with kingdoms in them from ToroQuest. They should be compatible, however I have not tested it. You could make a testing world and increase the village spawn rate to make the testing easier. I've tested and they seem to be compatible as far as I can tell. Toroquest villagers and MCA villagers both spawn in the same village. this mod make cow spawn much more rarer? Hello can u add a map into the cartographer's sell to localize the Lord Bastion's donjon ? We were planning to do that, https://github.com/ToroCraft/ToroQuest/issues/98, however we never figured out a convenient way to accomplish it. And do something like the way to find the stronghold but with an other item than eye of enders. Maybe doing an item with bone skeleton ? So i can't Find any of the Villages within the mod. I'm not sure if it requires a type of world but i did it in a default world and a SuperFlat world. I'm uncertain if this question has been asked before but. I'm wondering how to reset your rep in this mod? I sorta don't like going to towns only to find out that I have rep with said town from a past map. Also I'm on the 1.12 version of this mod. You need will need to be OP, then go into a civ that you want to change your rep for, then I believe the command is /tq rep 0, where 0 is the desired the rep value. I'll do that next time I'm playing my custom pack. Would you be able to implement a fix for the sentries spawning in the nether for MC 1.10.2? I see there was a report of the issue, but the fix appears to be only for MC 1.11.2. Thank you.